This tutorial was converted from a HTML document and needs to be futher converted into wiki style. 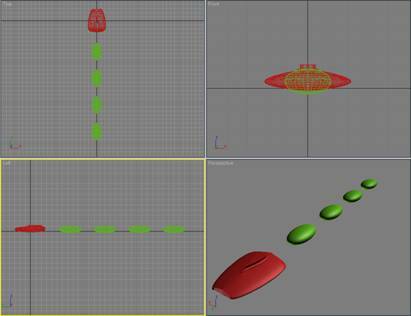 Simply apply X3 textures to a suitable mesh that someone else has created. 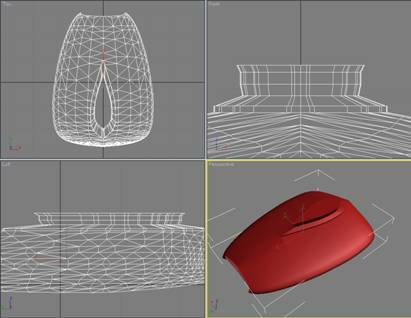 Modify an existing mesh and apply X3 textures. Use some one's prior work as a reference model or template to build your own model (like using tracing paper over a picture of the Mona Lisa to sketch an outline, which you then paint for yourself). Create an original work from scratch. Note: Obviously, whenever you use some one's work you should get permission if possible, and if not (say, for an older mesh you find on the web) you should at a minimum give credit to the original author. While it's not written in stone, I believe you should do this regardless of the use you make of someone's work... even if it's only used as a reference model for a mesh you create yourself. OK... in the DDRS mod, I've done quite a few ships using method #2 and #3 above, as well as a few using #4. 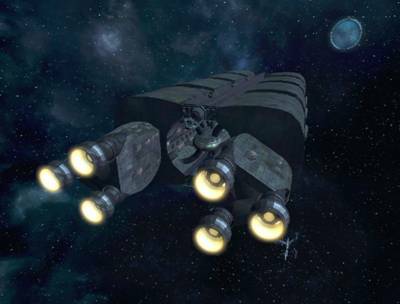 However, for this tutorial, I am going to step you through a fairly simple model of a TP-class ship, using the fourth method. There are far too many ways to model things in 3ds Max for me to begin to cover (even if I knew them all... which I don't). If you are keen to become an expert, there are heaps of tutorials available on the web, as well as numerous sources for more formal education on the topic. 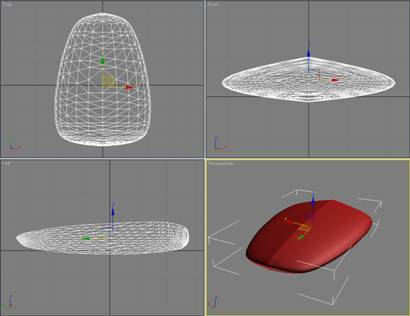 Note that you can as well use gmax instead of 3ds Max. Technically gmax is 3ds Max 4. Also, unless otherwise specified, I generally use Editable Polygons. After I perform a series of operations on a mesh object (like applying the Slice Modifier followed by the Cap Holes Modifier), I typically click on Convert to Editable Polygon to collapse the stack. 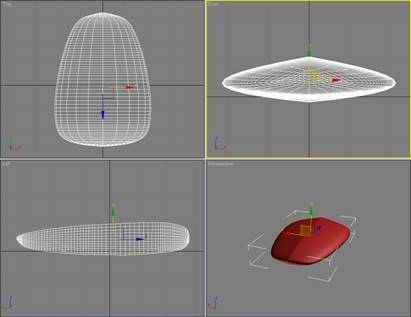 It is, of course, your choice whether you like to work with Editable mesh, or Editable polygon... they both work, but for the purpose of this tutorial it will help to know what I am working with. The first place to look for information on how to modify X3 is the Scripts & Modding Forum, on the Egosoft web site. There are threads which are locked to the top of the forum, which contain numerous links to useful information, interesting tools, tutorials, and threads specifically about modding. Also, you will not be able to use this tutorial until you pop over to doubleshadow's site (and yes, the d in doubleshadow is supposed to be lower-case). You can find it at: http://www.doubleshadow.wz.cz. 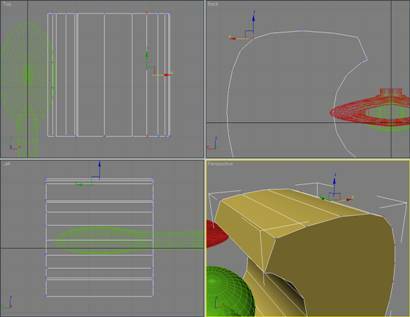 Here you will find the DBOX, which is essential to building X3 graphic objects. While you are there, grab the X3 Editor and X3 ModManager (if you don't already have them), since you will need these tools to actually get your ship(s) flying in X3. 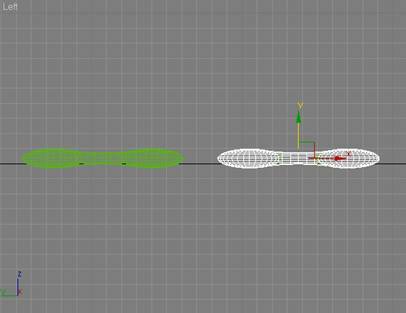 OK, the first step is to create the mesh for the front section of the ship. 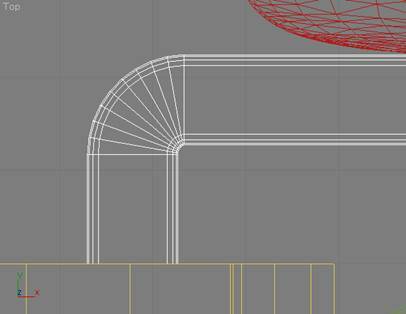 Because I want nice swoopy lines and curves, I'll be using Splines and the Surface modifier. Go to the Create panel, select Shapes, and click on Line. 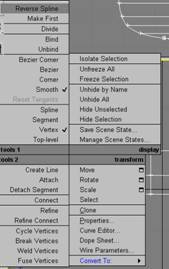 You will want to set the Drag Type on the Creation Method rollout to Smooth. 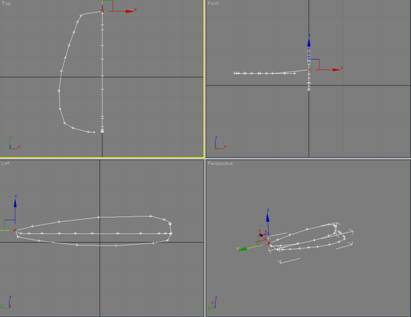 Make the Left viewport your current focus, and draw the profile of the front section of your ship. 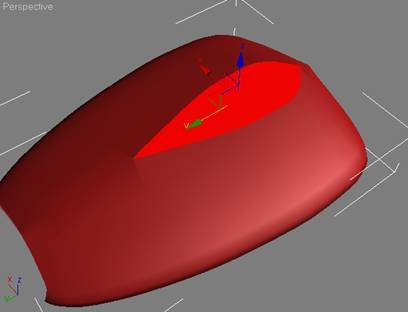 Right-click on the spline, select Properties, and on the General panel of the Display Properties pop-up, turn on Vertex Ticks. 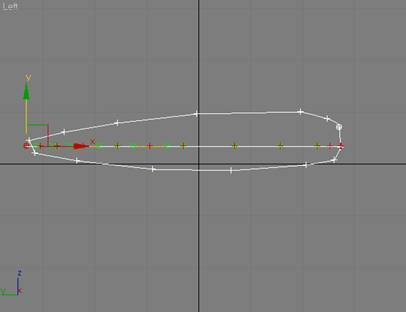 Right-click again on the spline, and select Convert to->Convert to Editable Spline. On the Modify panel, call your spline object something imaginative - like front. Right-click anywhere in the top viewport to make it active, and on the Modify panel, go down to the Geometry rollout and click on Create Line. Then right-click on the 3D Snap Toggle to display the Grid & Snap Settings, and make sure that Endpoint is turned on, and that Grid Points is turned off. On the Options panel of the Settings dialog, make sure that Axis Constraints is turned off, and close the dialog box. Do the same with the back of the left-side profile. We are going to need to draw lines from the top of the profile, around the side, to the bottom of the profile. 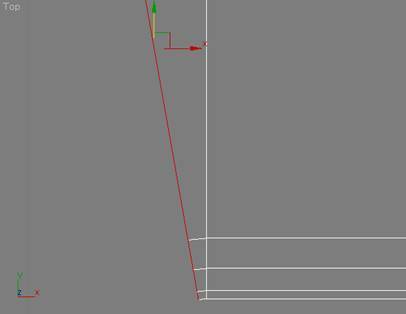 The lines will need to start at a vertex, go through a vertex on the side, and end at a vertex at the bottom. 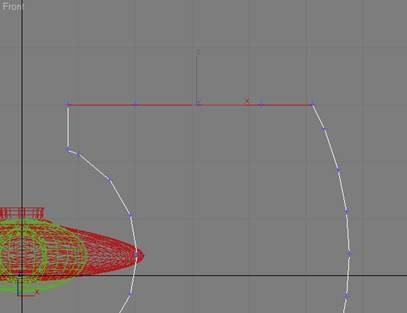 To do this, we will want to make sure we have the correct number of vertices, and that they are properly lined up. 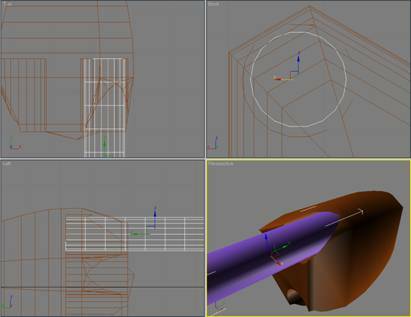 Make sure that the spline is selected, Vertex is selected on the Modify panel, and that 3D Snap is turned off. 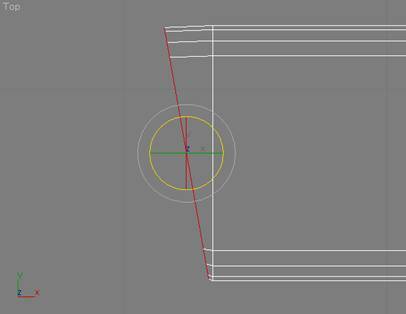 Now click on Refine in the Geometry rollout, and start adding vertices. 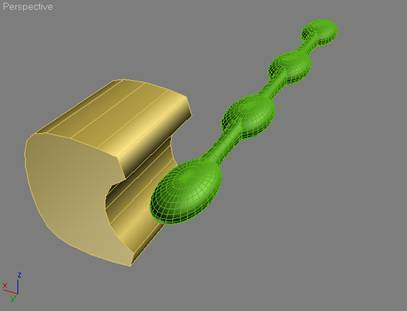 Now turn the 3D Snap toggle back on, and click on Create Line on the Geometry rollout. OK - now for the tricky part. 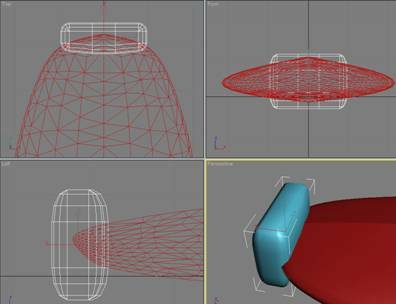 Turn off 3D Snap, and select all the vertices (Ctrl-A). 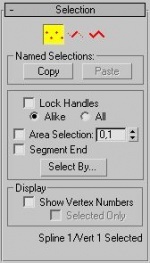 Right-click on the spline, and then select Smooth for the Corner Type. At this point, you need to be a bit creative. 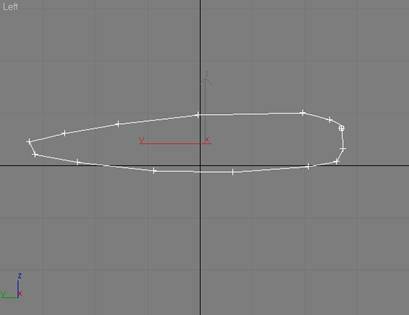 Start selecting the individual vertices, and move them around until you have a nice smooth shape. Pay attention when selecting vertices, as they are not welded (yet), so it is important to select both vertices in a given pair by dragging a box to select them. 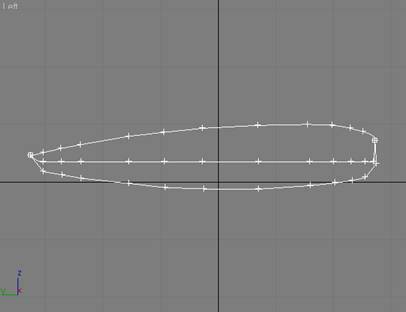 When you are done moving things around, make sure that the spline is still selected, and that the vertex sub-object selection is turned off. On the Modify panel, select the Surface Modifier from the Modifier rollout list, and then turn on Flip Normals and Remove Interior Patches. 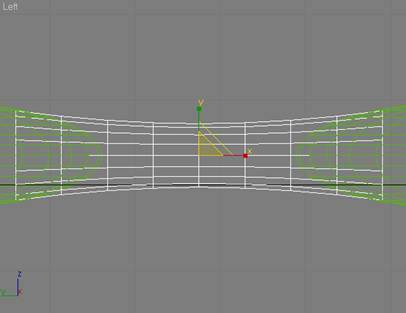 At this point, I like to covert the spline to an Editable Polygon, and apply a Mirror modifier to see what I have. I'm more concerned at this point with the basic shape. There will be way too many polygons for such a simple shape, but I will take care of those in a minute with Polygon Cruncher. The next step is to add some detail, like a bridge with windows, and maybe a small cut-out in the nose portion to locate a sensor array. 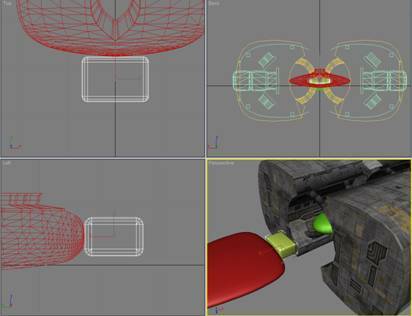 For this, I'll use the Boolean Compound Object in 3ds Max. 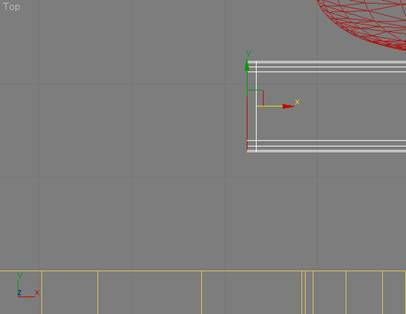 Please note: you should be very cautious in your use of Boolean operations in 3ds Max. It can be a bit flaky depending on the underlying mesh, so it is not always something you can count on. Using Create->Geometry, select Extended Primitives from the pull-down menu, and then click on ChamferBox. 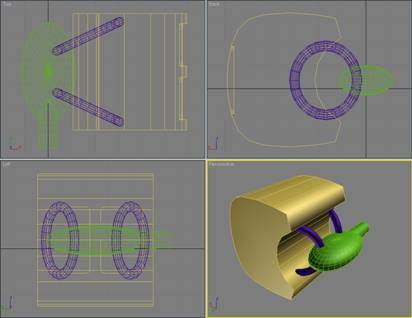 On the Parameters rollout, set Width Segments to 3, Fillet Segments to 3, and leave the Length and Height Segments at 1. Now select the front section, go to Create->Geometry and select Compound Objects from the pull-down menu, and then click on Boolean. Make sure that Subtraction (A-B) is ticked on the Parameters rollout, click on Pick Operand B under the Pick Boolean rollout, and then click on the ChamferBox you just created. 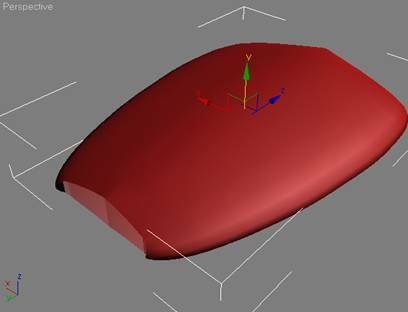 Note: If the Cap Holes modifier doesn't work correctly, then undo it, convert the front section to an Editable Mesh, select the Polygon sub-object, and then use Create to connect the vertices into polygons. 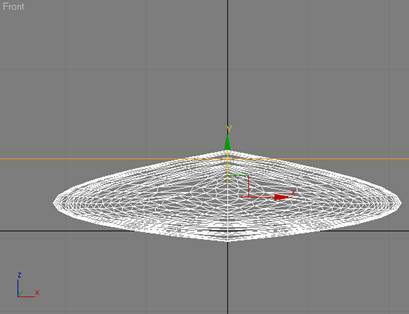 So I now have a mesh with 1,753 polygons that I can use for the front section of my ship. I'll wait to texture it until I get the rest of the hull built. 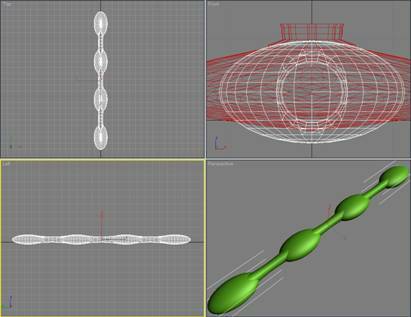 OK, the first thing I want to do is create the spine that will run the length of the main hull. I build this using simple Standard Primitives off the Create->Geometry menu. 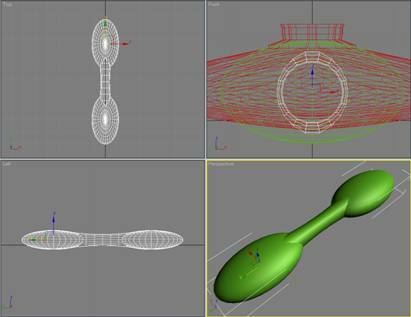 If you look at the sketch I made, you will see that the center of the hull consists of a series of spherical lumps connected by cylinders. You should take care to space the sphere objects at a uniform distance from each other. 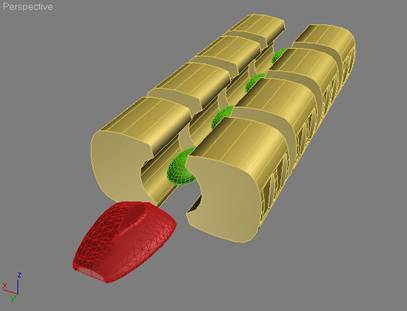 Next, I built the connecting portions by using the Cylinder shape off of the Standard Primitives menu. I used a cylinder with 18 sides, and 8 height segments. I positioned it so that it is centered on the spheres I just created (e.g. 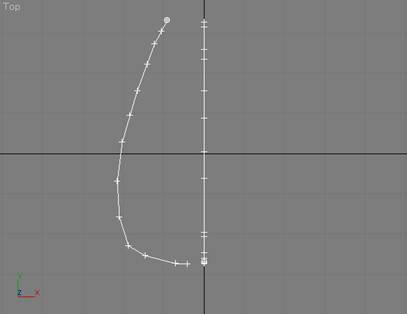 the same values for the x and z axis). It is not necessary to be precise in sizing the cylinder, since we can always push and pull it into shape as we go along. For simplicity, I made the initial cylinder roughly the same height as the spheres. 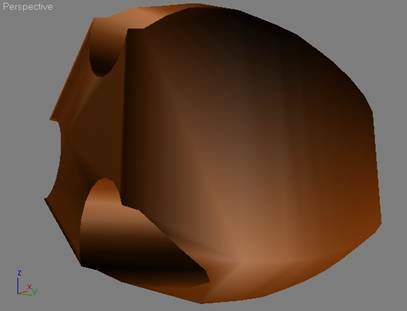 Note that the cylinder is exactly centered between two of the spheres, and that its diameter is now noticeably smaller than the height of the spheres. OK, we will need two more of these cylinder objects to join the other spheres. I made two copies, and hid one of them. I then moved the remaining copy down between the last two spheres. 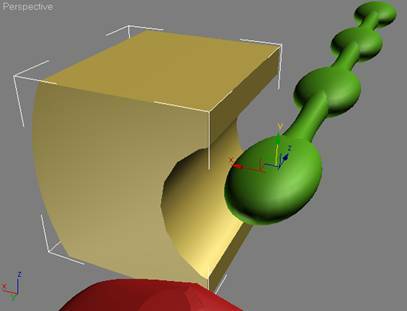 Next, select the two spheres that are overlapping the original cylinder and attach them (click on one of the spheres, select Attach from the Edit Geometry rollout, and click on the other sphere). 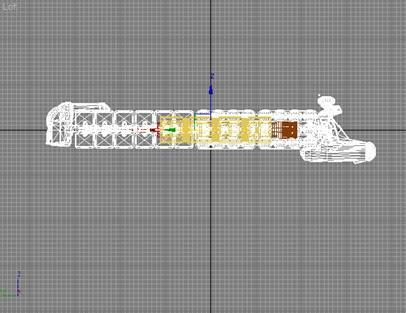 Now all that is left is to join the two parts of the hull spine into a single object. 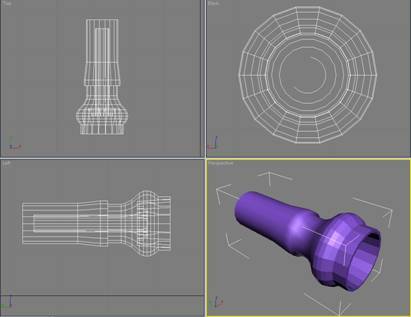 Take the hidden copy of the cylinder object, position it in the exact center of the hull spine, and use the Boolean Union operation we went through previously to merge everything into a single mesh. Now I need to create the cargo pods. Since the ship will be symmetrical, I can work on a single side, and then mirror it to get the completed cargo pod section. I could create a slightly different appearance to the bottom, but in the interest of simplicity, I'll just use the Slice Modifier to chop off the bottom portion, and then use the Mirror Modifier to create the completed mesh. Note: I removed the extraneous horizontal edge that was left on the ends by the slice/mirror operation. At this point, just to keep everything nice & tight, I converted the cargo pod to an Editable Mesh, selected all of the vertices, welded everything together (after bumping up the weld threshold slightly), and then converted it back to an Editable Polygon. OK... the basic cargo pod is done! I then made a clone copy of it that I will use to further develop the remaining elements of the cargo pod. However, before continuing, I like to see what the basic shape of the hull is going to look like, so I can make any adjustments necessary to the cargo pod. To do this, I will clone the cargo pod 3 more times, and position the copies along the spine... in line with the lumps. Hmmm... not bad. 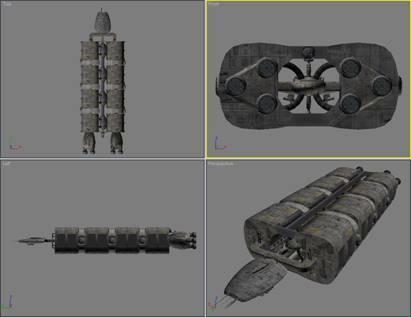 OK, we've decided that we can live with it, so now it is time to go back and develop the basic cargo pod a bit further. 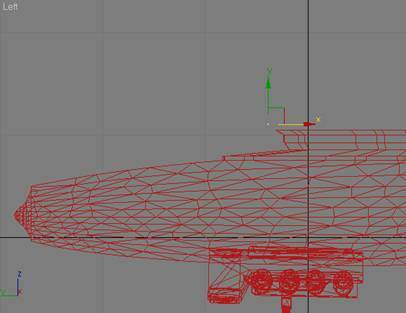 In order to simplify the final texturing, I have made the hull symmetrical. This way I can work with a single cargo pod, get the mesh fully constructed, apply the texturing I want, and then clone/mirror copy it to build the complete hull. You can delete (or hide, if you prefer) the combined cargo pods we assembled in the previous step, since we will rebuild it later. 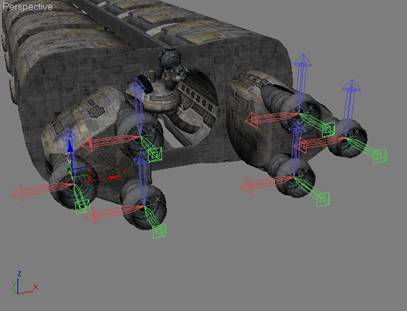 For the next few steps, we will only work a single cargo pod, and a cloned copy of one of the lumps from the spine. 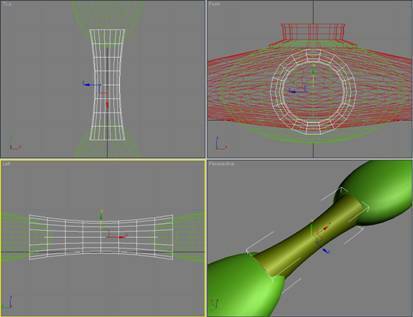 Go ahead and use the Boolean Union operation to merge the two torus objects into the cargo pod. This step is pretty much free form, and is really based on my understanding of what is available in the X3 texture library. 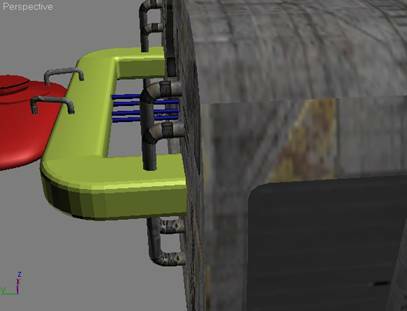 There are some pretty nice circular textures, plenty of technical detail, and a few gas tank textures. When I start modeling a ship, I already have decided on the basic texture set I will be using... and that decision has a significant impact on the shape of the objects I use to construct the actual ship. The curved panels on the top and bottom will receive see through DDS textures, as will the rectangular cross-braces. As you can see, the top and bottom are again symmetrical, so I can create the top half, and then mirror it for the bottom. Using symmetry wherever possible will reduce your workload by up to 50%. 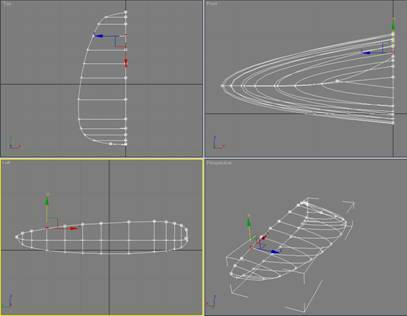 Clearly, it helps to plan ahead, and ensure that your ship design will let you take advantage of this capability. 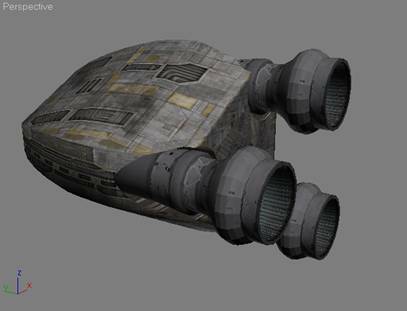 Also, some of you may have noticed that the purple cylindrical object is shaped very much like one of the large tanks on the Teladi TL... that is because I cut of off of that model and put in an a library of shapes that I can reuse. Our good friends at Egosoft have built some excellent models, and a smart modeler will not hesitate to chop off a few bits here and there and save them for re-use in your own work. There are quite a few excellent tutorials on texturing that come with 3ds Max, and I would encourage you to run through them to become familiar with the basic texturing tools. Also, spend some time going through the Egosoft-supplied texture library. 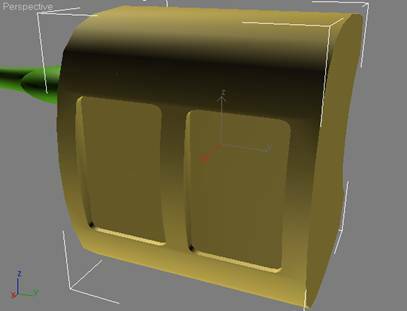 If you know ahead of time that you can use a DDS texture to create the detail effect you are looking for, then you can avoid the need to create unnecessarily complex objects. The next step is to build the parts that attach the front section to the hull spine and cargo pods. This can be fairly simple, since we will again be relying on DDS textures to make things look good in X3. 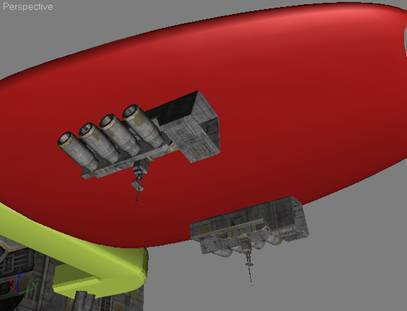 It seems to me that the simplest solution is to build an arch between the two halves of the hull which passes just behind the front section... and maybe some pipes running back to the spine. Hmmm... not bad, but it looks a bit plain, eh? Here is where you can really make up time. 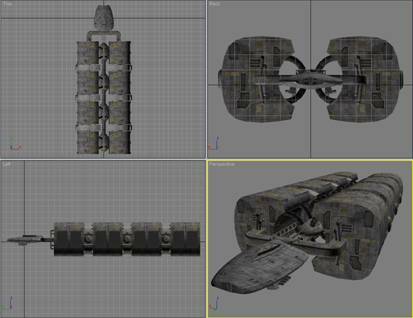 As I mentioned previously, the folks at Egosoft did some mighty fine modeling, and since I am going to be using their textures... why not grab a few parts off some of their ships to add the missing detail? 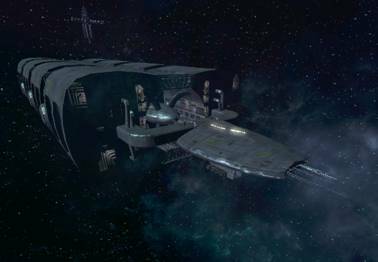 Since I am using a number of textures from the Teladi scheme, I'll go and grab some pipes from the Teladi TL. Here we are with the pipes applied... getting better? Before we get started on the thrusters, I'll give you a view of the ship as it is currently textured. However, I would also like to point out that once you get a ship into X3, and actually get to see it in various light settings... you will almost certainly find elements that you want to tweak. For me, this most often involves texturing. At the risk of boring you with disclaimers... as I said at the beginning, I'm no artist! Now... on to the thrusters! 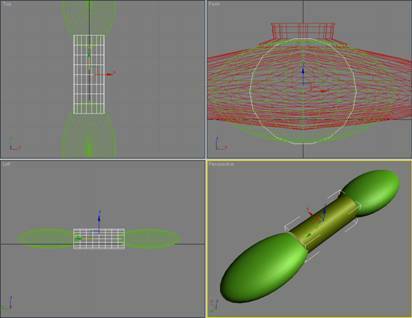 First, decide on the general configuration of the thruster. Unless you are following a specific design, I find it easier to wait until the rest of the ship is done... in hopes that I'll be struck by an inspiration. For whatever reason (possibly insanity), I decided to go with two main thruster bodies, one for each hull side, and to have three thruster nozzles in each body. Since I wanted three nozzles, I chose to start with three-sided Gengon object. I could have used a sphere, or even a box object, but I have had good luck with Gengon. (It is in Create->Geometry->Extended Primitives.) 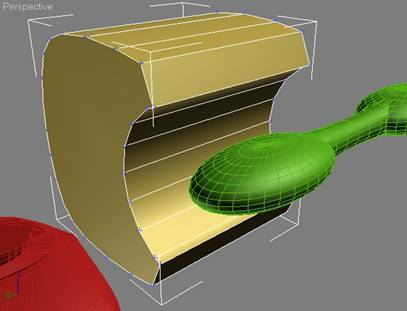 Once I had the initial Gengon shape, I used a series of Extrude and Uniform Scale operations to create the basic thruster body. 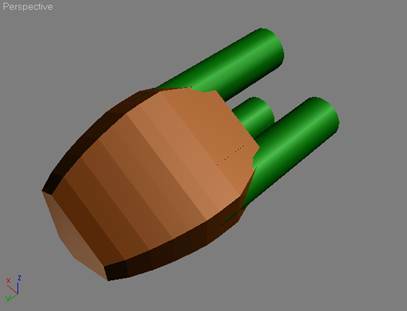 Once I had the right shape for the thruster body, I used three cylinders as my cut-out for a Boolean Subtract A-B operation. Remember, Boolean operations can be a real pain. You may want to avoid them until you are comfortable working at the vertex level. 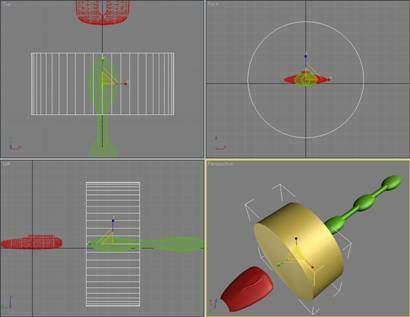 Unless the A & B objects you are working with are very simple, you will almost certainly need to move, weld, remove, etc a number of vertices in order to get things looking pretty. Now to shape the nozzles, I started with a cylinder (18 sides, 10 height segments). It is easy to add height segments as you go along, but since I knew in advance that I would be using quite a few in order to create the ridges and curves that I had in mind, I started with 10. 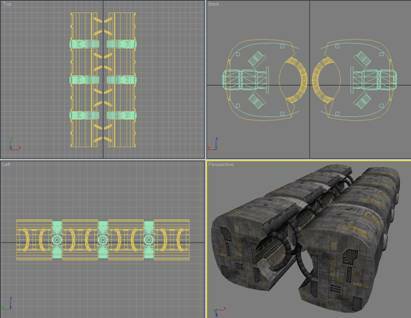 I have employed a fairly complicated internal structure, since I plan to use a number of self-lighting DDS textures. Otherwise, I wouldn't have wasted the polygons. 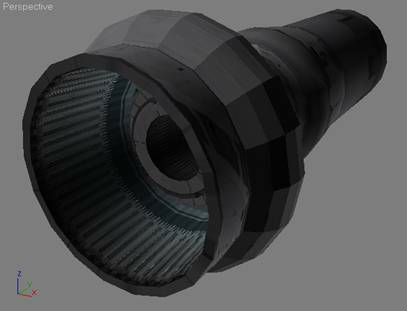 Here is the nozzle after texturing. Remember, you can't really see what it will look like until the X3 rendering engine gets a hold of it in-game. After doing a mirror/copy to get a thruster on the other side, I can un-hide everything and (hopefully) have something that looks pretty much like an X3 TS class ship. To be honest, that is pretty much what I was hoping to end up with. Rest assured, that's not always the case! As I said previously, once you play around with a new ship in-game, you will always find a number of things that can be improved. No, all we need are a few finishing touches like a cockpit, and a turret, and we are ready to export out new ship into X3! At this stage of things, there is a fair bit of personal choice involved. If you are only going to make one or two ships, go ahead and do it in the easiest way possible. However, if you end up doing very many ships, you will thank yourself if you establish some conventions right up front. I won't describe my entire development workbench (that's another tutorial in itself! ), but you should at least have some idea of how you want to store your work. Within my development environment, I have separate folders for each ship. 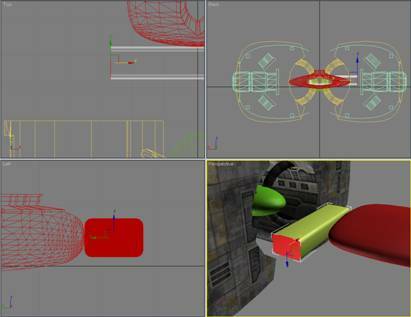 Within the root folder for a ship, I keep the various versions of the 3ds Max files, as well as the X3 scene file for the ship. In addition, if I am using a unique multi-texture for a given ship, then the text file with the X3 texture definitions is also kept here. In the root folder, there is a sub-folder called /parts. This is where I save the various parts for a ship when I use DBOX to export them. 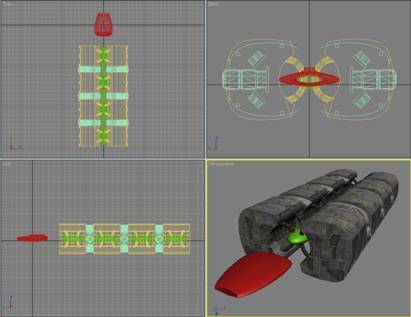 Nothing says that you can't simply lump everything together into a single mesh... Egosoft frequently does. 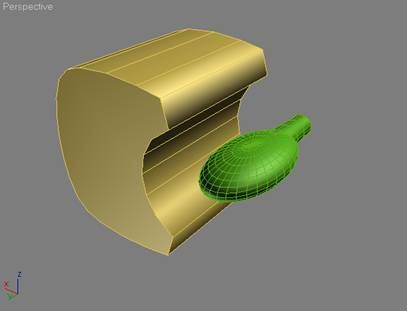 However, I prefer to group the various 3ds Max objects I create when building a ship into 2 or 3 (sometimes more) parts. It's a personal preference thing, and you can do it however you like. 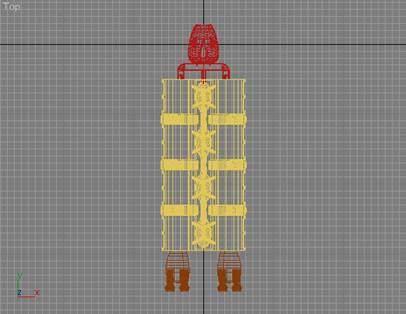 Here I have imported a large Paranid TS, and you can see that my model is too small! 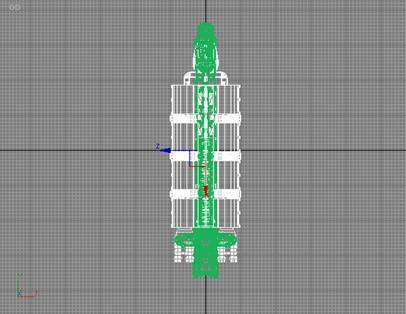 Since I've already grouped the parts for my ship, I can use Uniform Scale to adjust the size. So I delete the Paranid model, and get ready to start exporting my ship. However, before I start, I need to add in a couple of special X3 objects, to complete the ship. 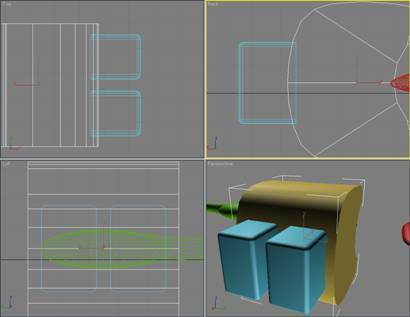 A copy of the Egosoft-supplied cameradummy.bod file from the unpacked X3 folder called objects\ships\props. A copy of my custom d_turret_b91_dummy.bod file (a dual-laser turret). 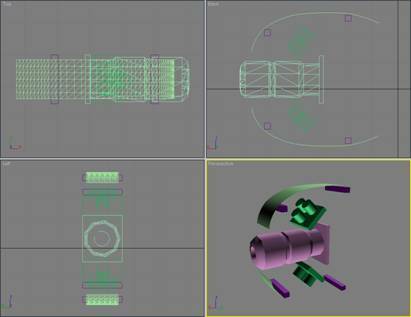 A copy of the fx_engine_emitter.bod file from the unpacked X3 folder called objects\effects\engines. Next, you must rename the cameradummy part to ships\props\cameradummy_1. This is essential, since without the ship\props\ path information, X3 will not find the part, and without the _1 suffix, X3 won't know that this is your main cockpit viewpoint. 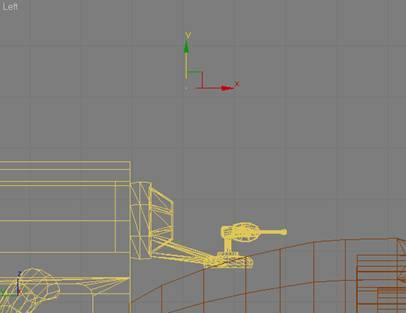 The second step is to position the turret. I rotated it 180°, and placed it on the top portion of the aft cross-brace. 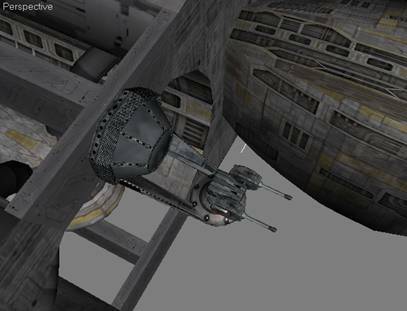 We also need to rename this part to ships\props\d_turret_B91_dummy_2. I always follow the Egosoft convention of keeping general use ship parts in the ships\props folder. The _2 suffix tells X3 that this turret will be fired from the #2 cockpit... which we'll add now. Rather than importing another copy of cameradummy, I simply clone the one I already have, and rotate & position it as appropriate. 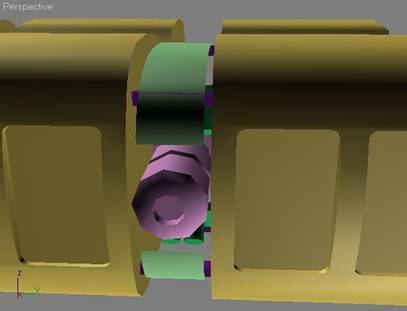 (Remember, the turret has been rotated 180° so that it will be facing aft, so we need to rotate the camerdummy part in the same way.) This time, we rename the camerdummy part to ships\props\cameradummy_2, to let X3 know that it is the #2 cockpit. The final (and optional parts) that I will use is the fx_engine_emitter. To use this part, it must be rotated 180° (looking from the top), so that it faces aft. You will also need to rename the part to effects\engines\fx_engine_emitter so that X3 can find it. I clone it 5 times (so that I have six of them... all with the same name), and place them in the center of each thruster nozzle. The final step before we can start exporting the parts and scene file, is to rename the custom parts of the ship. 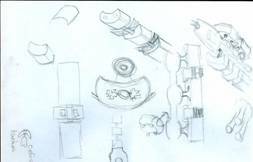 Just as was the case with the cameradummy part, X3 needs to know where we have put the parts in order to be able to render the ship in X3. In my case, the parts will go into a folder named ships\Deadly\TP-Mk3\parts. And the scene file will go into ships\Deadly\TP-Mk3. From the Utilities menu, select Reset XForm, and then click on Reset Selected. From the Utilities menu, select Collapse, and then click on Collapse Selected. Carefully note (and write down, if needed) the x, y, and z coordinates of the part. Set the x, y, and z coordinates to 0, 0, 0 (zero, zero, zero). In DBOX panel, go down to the Exporter rollout, make sure that Body is selected for the File type, and then click on Export Sel. When prompted, locate the proper folder, and enter the name of the part... only the name... no path information! 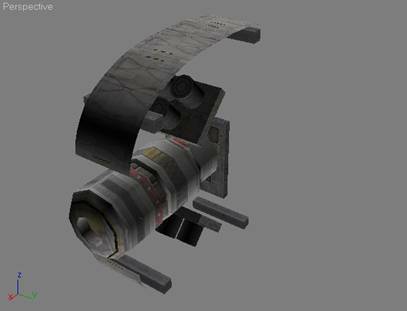 For example, the parts called ships\Deadly\TP-Mk3\parts\front gets saved as front. Restore the x, y, and z coordinates to their original values. 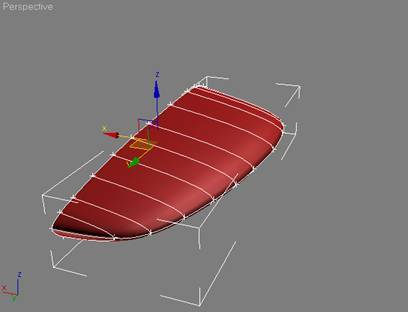 Once all your custom parts have been exported, it is time to export the scene file for the ship. To do this, select all parts (including cameradummy the turret, and the engine effects parts), go to the DBOX Exporter rollout again, and make sure that Scene is selected for the File type this time, then click on Export Sel. In my case, I move up one folder to save the scene file. The scene and parts will load as is, however, they are in text format, and the textures won't be right. Somewhere on the Egosoft forums, I have written a brief tutorial on how to use X3 textures. At some point, I will find the time to track it down, clean it up, and post it here. DBOX is exporting the bodies in BOD format. This means that they can be read and edited in any standard text editor. Note: Until I get around to writing an X3 Texturing Tutorial, go to the Scripts & Modding Forum on the Egosoft web site, and check the threads at the top of the page. Somewhere in there I describe how to do this in detail. I've been asked several times how to apply X3 textures to custom ships...and I know I've written this at least three times and sent it to people, but I just can't seem to find it. Since I've just been asked again, I'll do what I should have done at first, and post it here in the forum. Before I continue...let me make it very clear...caveat emptor! There may be easier ways of doing this, and subsequent versions of DBOX (or the release of the X3 Modder Kit) may eliminate the need for the following steps. What I describe below works for me...every time. If you find an easier way, please post it so everyone can benefit. OK...the first thing I had to do was create a "template" of the textures I wanted to use. By template, I mean an existing MAT6 multi-texture I could apply to my own meshes. The way I went about this was to select a ship already in X3 which had a set of textures I wanted to use. Most of my ships use the base texture set that is associated with the Argon M2, since it looks pretty good and has a fairly large number ( 48 ) of DDS textures to choose from. So...you have picked a ship which uses the texture set you would like to apply to your own mesh(s). Now you must: 1. 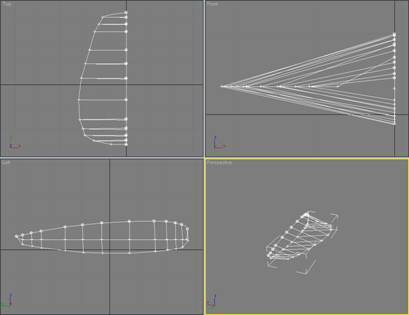 Use Doubleshadow's X2BC to de-compile the BOB file for your selected ship into a BOD file, and then import it into 3dMax using the DBOX tool. 3. You then save the multi-texture associated with the BOD file you just imported to the 3dMax texture library so it can be used later on your won meshes. 4. Once the X3 multi-texture is saved, you must open the original X3 BOD file you used to get the multi-texture in a text editor. In the text editor, select the MAT6 entries at the begriming of the file then save them as a text file (it should only contain the MAT6 entries). (The Argon M2 multi-texture that I often use has 48 MAT6 entries.) The resulting text file is what I call the "template", and it should be an exact match of the multi-texture you saved earlier. 4. 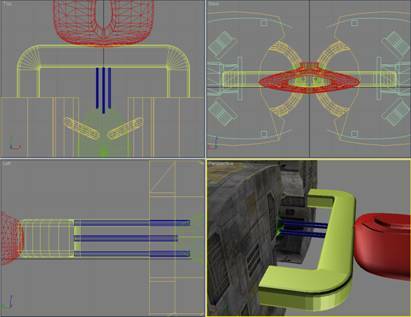 Then, when in 3dMax, you can load the X3 multi-texture you saved, and apply it to whatever mesh you wish. 5. Once the mesh textured to your satisfaction, export it using DBOX (always remember to keep Data Handling and Comparability set to X3). 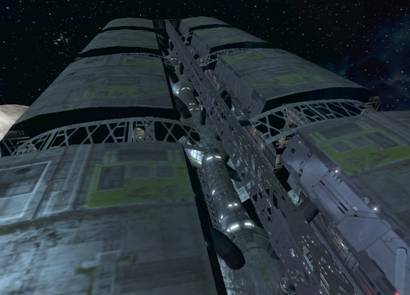 If you were to look at the MAT6 entries in the BOD file you just exported using a text editor, and compare them to the MAT6 entries in the X3 BOD file for the ship you selected, you would see that they are "broken". 6. So, the final step is to correct the MAT6 entries in your exported mesh by opening the BOD file in a text editor, as well as opening the "template" you had previously saved, and then using the copy & paste functions to replace the "bad" MAT6 entries in your exported BOD file with the "good" MAT6 entries from your template. You now have your mesh in BOD format, with X3 textures applied. It is quite easy to add X3 DDS texture entries to extend your template(s) using the same principals described above. 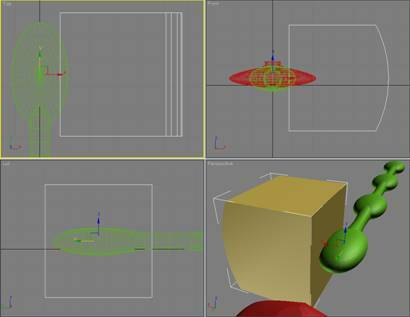 Since we are exporting data from our 3ds Max scene into a proprietary format, and Egosoft has not yet published an X3 Modders Kit (as they did for X2), there is some information in the output produced by DBOX that occasionally needs to be modified. Please note that this is only true for the ship I built in this tutorial because I chose to use the new big MATERIAL6 textures... which not only use the new DDS textures, but also employ the special graphic shaders as well. If I had chosen to use standard X3 textures, the output from DBOX could be used directly in the game. If you look at the part files exported by DBOX in a text editor, you will see a number of lines at the front of the file starting with the word MATERIAL6. Each of these lines describes an X3 texture. 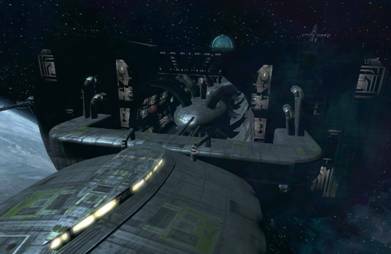 If you then look at the stock Teladi ship used to grab the textures for your ship and compare the MATERAL6 entries, you will see that they are different. So... the MATERIAL6 entries need to be the same. 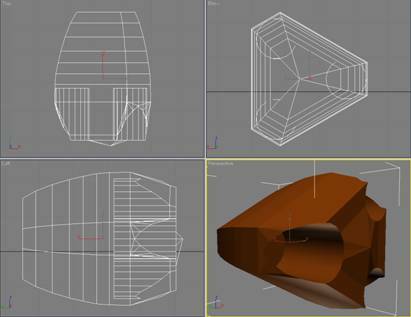 The easiest way to do this is to simply fire up your favorite text editor, and copy the good entries from the Egosoft BOD file over the top of the bad entries in the BOD files for the custom parts for your ship. Now that you have the correct MATERIAL6 information in your BOD file, you could use it as is in X3, and it would load correctly... if a bit (maybe a lot) slow. There is a reason the Egosoft's ships are provided in BOB (actually, compressed as PBB files, but lets not confuse things any more than necessary). X2BC (the same tool you would have used to convert the Teladi BOB file into a BOD file) can also be used to compile the edited BOD files (with corrected MATERIAL6 data) into BOB files. Whoa... what could be easier, eh? That's it! You're done! Simply fire up your trusty copy of X3 Editor and add the necessary entries to the TShips file, and then use X3 ModManager to package it into a mod. I know I have covered a huge amount of ground, and trying to pack all the necessary information into a single tutorial is sort of like forcing some one to take a drink from a fire hose, when all they really wanted was a sip of water. However, it was the best I could do (and much more work than I had planed). Hopefully some of you will find the information useful in your own modding efforts. This page was last modified 00:44, 31 January 2007.